This is one spectacular looking cheesecake. It is everything I love in a cheesecake, a beautiful crust, a light and fluffy filling, with a gorgeous jelly topping. This cheesecake has such a smooth texture when you eat it, it is not very sweet, it is just divine. I made this on the day I was serving it, but I recommend you make the crust and filling the day before and just do the jelly topping on the day you are serving it. Why, because if you look at my photo above you will see specks of white in my jelly. The filling did not have time to set completely, so some of it went into the jelly. By setting the filling properly this will not happen. The jelly needs to be done on the day you are serving it, as if done too early the strawberries may discolour. This is definitely a cheesecake to make for a large gathering as it serves 10-12 people. It is a beautiful way to end a dinner party. Is it difficult to make. It is more complicated than some of my other recipes but it is not 'difficult'. This cheesecake has a few different components you have to make, but if you follow my recipe step by step, it works. Quick tip, when pressing the crumb base into your prepared tin, make sure you focus on the edge of the circle base, you don't want a really thick piece of crust where the edge of the base starts going up the sides. So press into the base edge to push the crust up the sides, until you think it is ok. You can see in the photo below where the crust is thicker, that is the area you need to concentrate. Even I should have pressed it more. Take the cream cheese out of the fridge at least 1 hour before you need to use it. This will ensure a lump free cheesecake. It is important to use the right sized tin, as this cheesecake goes right up to the top of the tin. Invert the base of a 24cm (base measures 22cm) x 7cm deep springform pan. Grease the tin with some cooking spray. Line base and sides with baking paper, extending 5cm above the edge. Strawberry Filling: Place the strawberries and sugar in a medium sized saucepan. Over medium heat, stir until the sugar dissolves. Simmer for 6-7 minutes, or until the strawberries begin to collapse. Sprinkle gelatine over water in a small heatproof bowl. Allow the gelatine to bloom (swell up) for 1 minute, then place the bowl over a saucepan of simmering water, stir until the gelatine dissolves. Stir the gelatine into your strawberry mix. Allow to cool while you get on with the rest of the cheesecake. Base: Process the biscuits in a food processor until you have fine crumbs. Transfer to a bowl and pour over the melted butter. Mix well to combine. Pour the crumb mixture into your prepared tin. Press over the base and up the sides of the pan, to 1cm from the top. Chill for 20 minutes. Heat the jam and 1 tablespoon water in a small saucepan, stirring, until smooth. Stir in Cointreau, if using. Once the base has chilled for 20 minutes, brush the jam generously over the base and sides of your biscuit crust. Refrigerate while you make the cheesecake filling. Cheesecake Filling: Sprinkle the gelatine over the water in a small heatproof bowl. Allow the gelatine to bloom for 1 minute, then place the bowl over a saucepan of simmering water, stir until the gelatine dissolves, cool slightly. In a food processor, process the cream cheese, sour cream, sugar and vanilla bean paste until smooth. Scrape down the sides of the bowl at least once during this process. With the motor running, slowly drizzle in the gelatine mixture. Once all of it is added, scrape down the sides of the bowl, then process again until smooth. Transfer the cheesecake filling to a large bowl, fold in the whipped cream. Spoon half of the cheesecake filling over the base of your cheesecake. Dollop over half of the cooled strawberry filling. 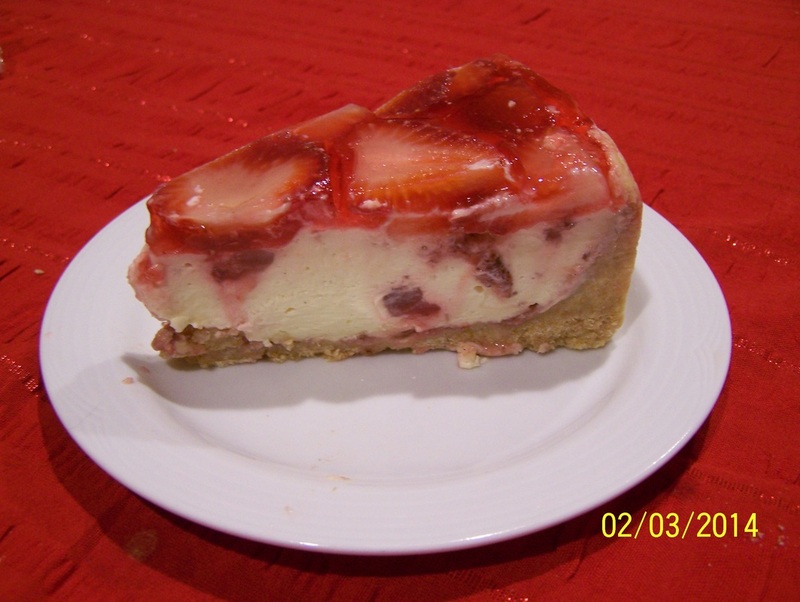 Swirl the strawberry filling through the cheesecake. Add the remainder of the cheesecake filling, dollop over the remainder of the strawberry filling, swirl through again. Refrigerate overnight for best results, or until cold and set. Topping: To make the jelly, dissolve crystals in the 100ml of boiling water in a medium heatproof jug. Add the 300ml of cold water. Allow to cool completely on your kitchen bench-do not refrigerate. 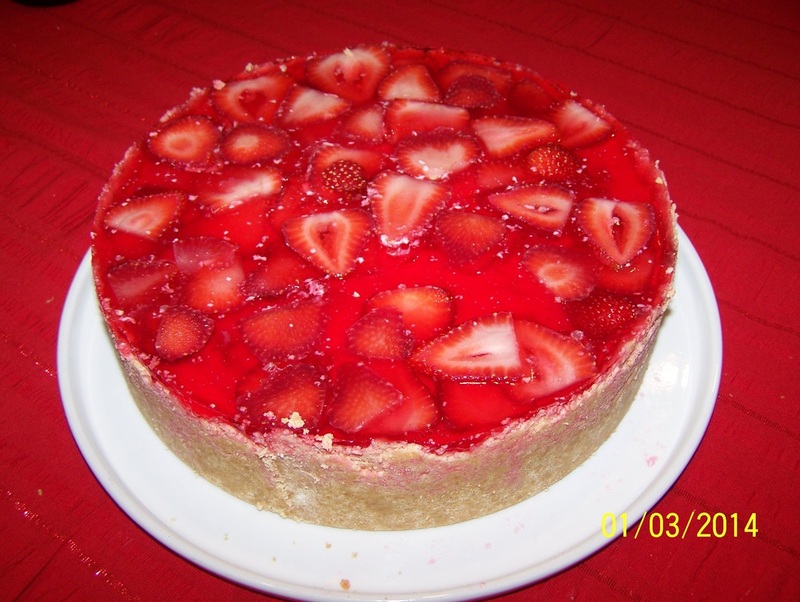 Once the jelly is ready to use, arrange the strawberries over the top of the cheesecake. Using the back of a spoon, slowly pour the jelly over the back of a spoon onto the strawberries. Refrigerate until set. It will need at least 3-4 hours. To serve: Remove the sides from the pan, peel the paper away from the sides. I like to use a cake lifter (super large spatula) to get between the base and the paper, then lift the cheesecake onto a serving plate. If you don't have a cake lifter, leave the paper on (just don't serve the paper when sliced).